Easy to use and remembers the reading from last time. Colour changing screen is a bonus. Excellent essential for your first aid box. Can be used when baby asleep too and the alert will not wake them up. The colour change is really reassuring as you don’t have to see the screen to check when the reading has been made. Would recommend! Takes a while to get the reading. Having a daughter who has been poorly on more than one occasion having a thermometer that is accurate is essential to us. This does exactly that it gives us a reading which is always the same as what the doctors would be. It’s good value for money and very easy to use and is comfortable for babies too. My only complaint is that it takes quite a while sometimes to get the reading which can be difficult when you have a wriggling baby who doesn’t want to sit still. I like the colour indication window that comes up green or red, I have never had it come up red thankfully but it’s peace of mind. It’s easy to use and clean but once it’s in place it can sometimes take a while to get a reading and if baby is wriggling it can read differently two times in a row. Great product Got me a real peace of mind . Accurate reading every time .easy to clean .. bit slow at taking the reading but still great product . Essential for my little one it’s always accurate when I have taken him to the Drs the temperature on his thermometer is the same as the Drs also it flashes green if it’s ok and red if it’s a problem. I always use it I couldn’t be without it. It’s hygienic just put under his armpit and it’s easy to use. My baby was in hospital for two weeks after he was born and we had brought an all singing all dancing thermometer for £50. The midwife laughed and told us to buy this as it was more accurate than the super costly one. Easy to take temp and works quickly. Nice little design. This is easy to use and simple to work but i did find sometimes it seemed to give inaccurate readings compared to others i have used. 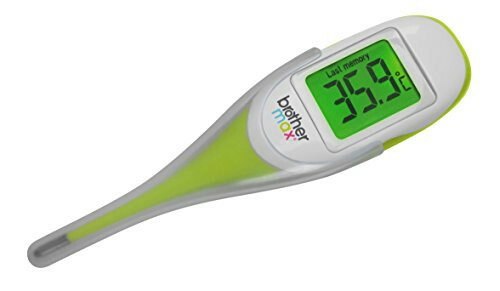 The Brother Max Flexi Digital thermometer can measure your child’s temperature orally but also from their underarm, with a soft tip for comfort. The large LCD screen allows you to see the displayed reading easily with its fast and reliable backlight. 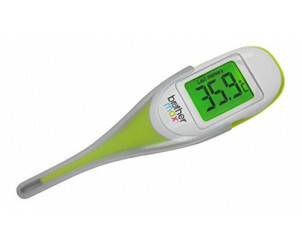 When the green backlight is lit, it indicates that your child’s temperature is normal. When the screen lights up red, your little one’s temperature is higher than it should be.